There is a long history of weaving in Lesotho. 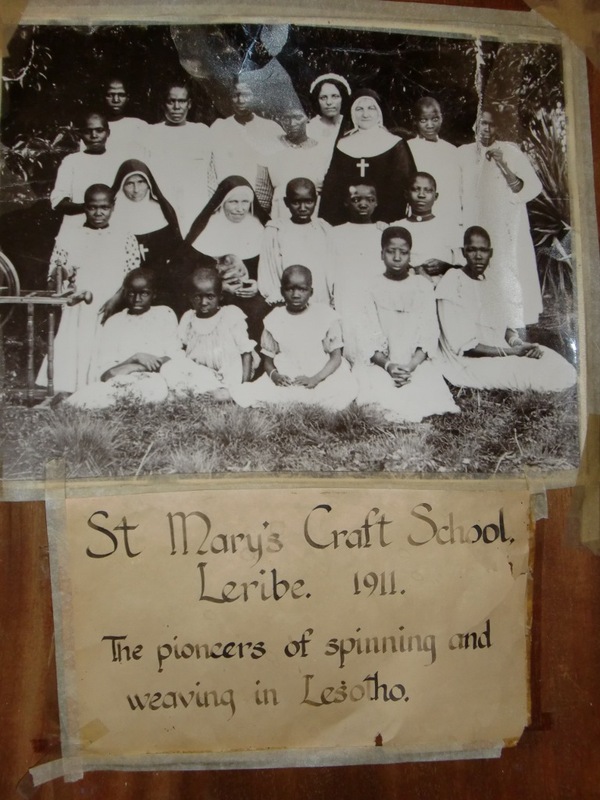 At the nearby Leribe Craft Center we found this photo proudly honoring “the pioneers of spinning and weaving in Lesotho” at St. Mary’s Craft School in 1911. The weaving process starts with collection of fibers from Lesotho’s large herds of sheep and goats. It was news to me that wool comes from sheep and mohair from goats. As this photo collection from Sesotho Designs shows, the coat or fleece is removed once per year, generally after the winter, when the herders bring the animals down from the mountains. In our area this usually happens at a communal “shearing shed” by men using shearing blades that look like a type of very heavy duty scissors. The fibers are washed then “carded” by passing them between carding combs (blocks with teeth) to separate the fibers and prepare them into a roll for spinning. 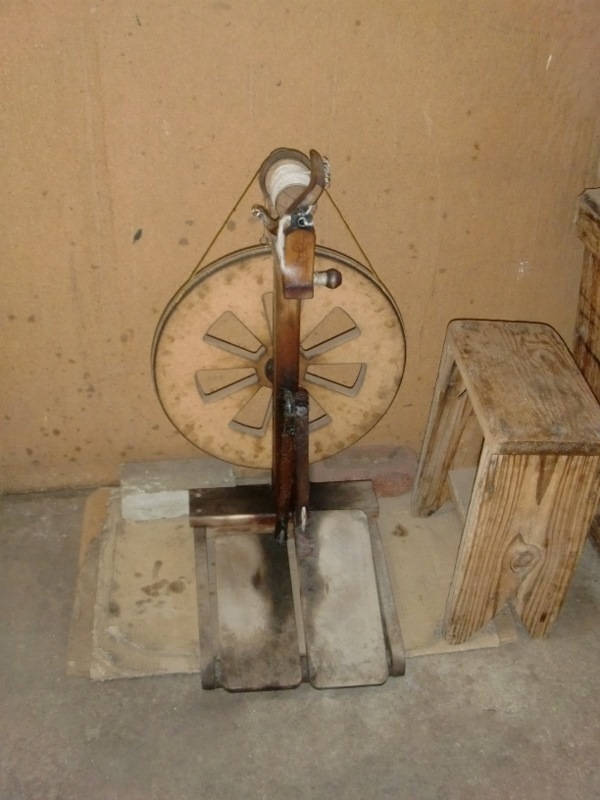 The spinning wheels are operated by foot petals twisting the fibers into long strands of yarn. After it has been spun it is sold as is or dyed in coal pots. Once dyed the yarn at the craft centers is woven into a variety of products. 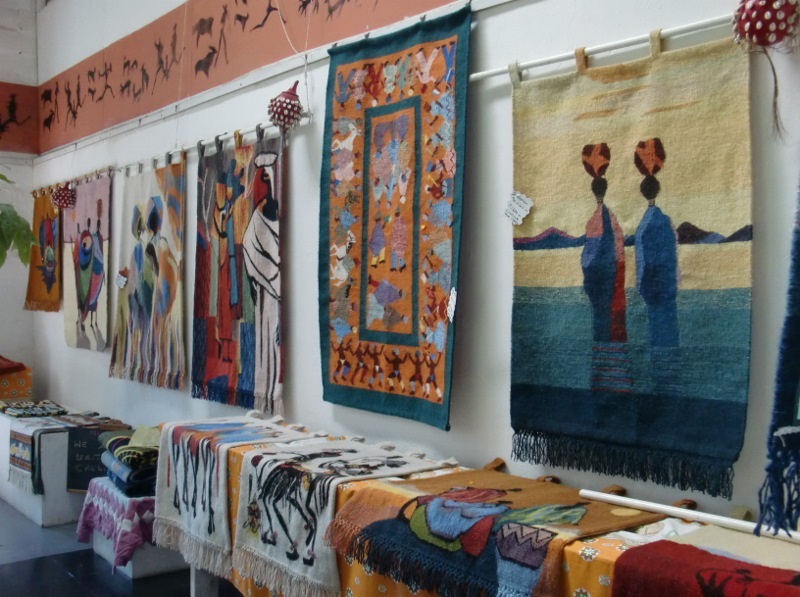 Some, like Sesotho Designs in Teyateyaneg (TY) specialize in large and small tapestries while at the Leribe Craft Center we found tapestries depicting village life, clothing, shawls, hats and handbags. Both of these centers welcome visitors into the production areas to watch craftswomen work while they share their time and explanations. It was particularly interesting to see how the women standardize their designs by using a drawing behind the vertical threads, called the “warp” that the weavers use to guide the patterns, getting as creative as they like on color schemes as they, by hand, weave in the “weft”. And it does appear to be women’s work, at least at the Craft and Weaving Centers we visited. In village, however it’s the boys who do the weaving, typically caps. No standardizing for these guys and the results are as fun, beautiful and individual as they are. 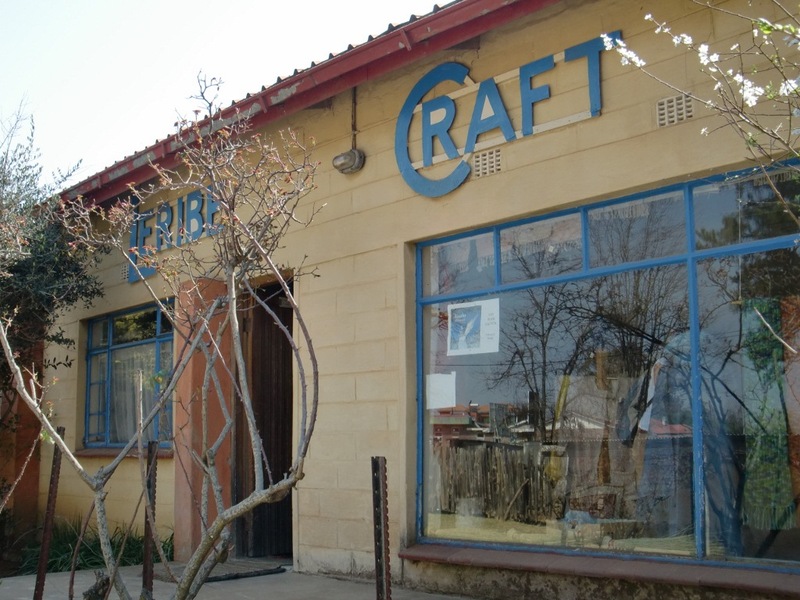 If you have a chance to visit Lesotho and would like to see the major weaving centers they are listed below with their GPS data, information from www.threadproject.com. If you are reading this from afar you can check them out on Google Maps. Mine was purchased in 1983, in Swaziland, and is about 70 in. X 60 in. I was told it was entirely of mohair, excluding top edging with loops for hanging and bottom edging with fringe of a jute-type fibre. Label on the back gives weaver’s name, and designer’s name is stitched on the front. Maybe Maseru Tapestries and Mats (formerly Matela Weavers) would have some info., as their portfolio on this website shows a few photos of tapestries by the same designer as the one whose work I purchased. Contact me directly if you want a bit more info.